Hot news! Long awaited new version of Skyfire browser is finally available for selected S60 phones, including Nokia E71. The browser can be downloaded directly on your mobile at get.skyfire.com. New version marked as 0.85, which is offered for Windows Mobile devices for some time brings a lot of new features and redesigned user interface. More details soon! How to optimize web browsing with E71? Opera Mini, Skyfire, or native? Excluding Internet tablets the E71 has one of the biggest screens present at the moment in Nokia’s devices portfolio. In combination with a landscape screen mode, it should implicate it as a good web browsing tool. Is it so? I’ve decided to check three web browsers available for E71 at present. I’m going to compare a native Nokia browser, Opera Mini and Skyfire 0.6 available in beta testing stage. The test will be simple. I’ll try to display two popular web pages (WordPress.com and YouTube.com). plus one more – optimized for mobile devices (m.digg.com). I will take into consideration definitely subjective browsing comfort, any instability experiences, and browser’s speed. All three browsers installed on my phone will be using wireless connection (WLAN) and 1 Mbps DSL line. Let’s start with newest available tool – Skyfire. The tool is available in version 0.6, but it has already been announced that E71 will be one of devices supporting next release 0.8. Skyfire 0.6 crashed my phone right after the first start, but I gave it a second chance. Skyfire loads pages quite fast, which means less than 5 seconds, and automatically displays a whole page in one window. It makes the page illegible, but we can easily locate a part interesting for us. All you need to do then is to locate magnifying frame above area you’re interested in. Skyfire displays a given page after a quick process of focusing, so it looks funny, like setting a focus in a camera before taking a picture. 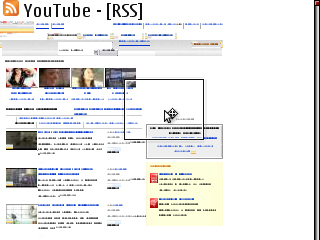 Both WordPress and YouTube were displayed correctly. The biggest advantage of Skyfire is that the browser supports Flash. Yes, it means it can playback videos on YouTube. Unfortunately, it is not possible to display videos in PC full screen mode; you can only magnify the part of page with a player. The video and audio playback works smoothly, but it happened that the browser simply closed itself a few times. Skyfire seems not to recognize pages optimized for mobile devices, so by default mobile version of Digg will be displayed as a standard page. It makes you use magnifying here, too. OK, so we have a good browser, finally supporting Flash, but still not stable and not supporting mobile pages intuitively. Now it’s time for Opera Mini. This browser, likewise Skyfire, is not a real browser actually. It uses a proxy provided by the Opera Company to optimize the amount of data transmission and a time of display. It means every time you input an URL the page is squeezed by Opera proxy server and then downloaded by your phone. There is a full version of Opera but currently for the S60 devices its version is older (8.65) than for UIQ and Windows Mobile. Before Opera 9.5 will be available for E71, too, Opera suggests using the Mini version. So I did as suggested. What was the result? In case of displaying WordPress and YouTube it’s OK. Unfortunately, it doesn’t support Flash, so you couldn’t watch video files. What’s cool is that Opera Mini presents m.digg.com correctly, I mean as optimized for small displays, but you need to uncheck small screens option before. Opera has some problems with displaying some more complex CSS and sometimes the loading process takes even several seconds. I can imagine it could be even longer with mobile data transmission. We know the cons so what are the pros? Opera Mini is very stable and it offers extra services like managing your bookmarks using you web profile at opera.com. It is very useful, especially, if you often change devices. Now it’s time for a native Nokia browser. I’ll start with the fact that it perfectly deals with mobile pages. 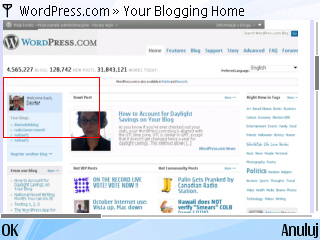 It also works fine displaying WordPress but by default it will only show you an upper left area of the page. You need to press 8 key to get the page miniature and navigate to an interesting area. I was using Nokia’s browser for a long time and I have observed only few crashes. Nokia browser supports Flash Lite 3.0, so YouTube movies are working fine. It is even possible to display videos in full screen mode. 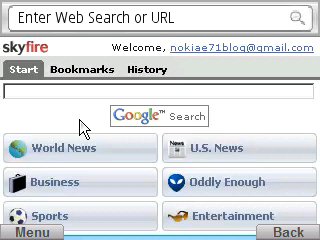 Regarding bookmarks management, the native browser can easily synchronize your bookmarks with your Internet Explorer directory using Nokia PC Suite. You may say it’s not very important. I think it does matter. OK, so who is the winner? If you expect Flash player, and single exits won’t bother you, stay with a native browser or try Skyfire. I’m sure version 0.8 available soon will make you (and me 🙂 even happier. If you are interested in the stability, you don’t have a flat rate (so you care about data transfer) Opera Mini is just for you. Easy bookmarks management is for free 😉 I’m sure the mature version of Opera 9.5 will be interesting as well. If you like starting your browser automatically by pressing 0 key, stay with the native browser. I personally stay with all of them, until we will get a definite winner in this category.